Is your Truck Stereo Lacking Bass? Call Us 877-424-0979. Get a Subwoofer box for your 2005 - 2018 Toyota Tacoma Double Cab and upgrade the sound quality you can get from your truck and a new custom made subwoofer box. This subwoofer box installs in minutes and is engineered to fit the 2005 - 2018 Toyota Tacoma Double cab. We use high quality MDF and precision manufacturing in all of our Subwoofer enclosures. Hole cutout for 8" Sub = 7"
Hole cutout for 10" Sub = 9 1/8"
NOTE: Please tell us what subwoofer you are planning to use, so we can ensure proper fit in your speaker box. 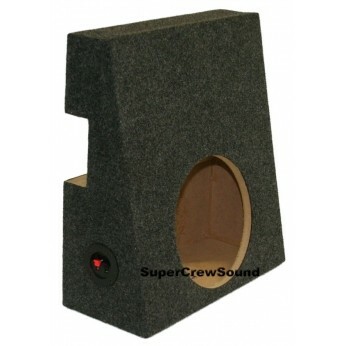 We build all of our Subwoofer boxes to order, so if you need your box to be customized we can do that for you. 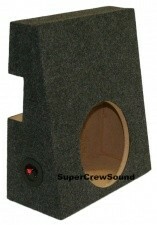 Most of our Subwoofer enclosures include multiple cutout size options, mounting depths and colors. If your subwoofer enclosure needs a non-standard hole size, just let us know and we will be happy to customize it for you for FREE! Toyota Tacoma Double Cab 05-18 Single Subwoofer Box 5.0 Toyota Tacoma Double Cab 05-17 Single Subwoofer Box 05/22/2018 By Lorena Quinata Great job, fits perfect. Really appreciate the way they wanted to get the specs right. Would use again and refer new clients. Toyota Tacoma Double Cab 05-18 Single Subwoofer Box 5.0 Great Box 12/12/2016 By David Hey guys. Just wanted to let you know that the sub fits the box perfectly! The little bit of shaving you did was essential and makes everything clear by just enough. Super happy, and I'd say you can add that pioneer model to the list of known good options. 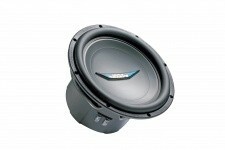 Toyota Tacoma Double Cab 05-18 Single Subwoofer Box 5.0 Amazing! 03/14/2016 By Randall Brusher This box is of the upmost quality. It is a tight fit behind the seat, but it fits like a glove once you get it in there. It also sounds excellent. The company is awesome as well. I placed my order on a Sunday, it was created and shipped out that next day and was on my doorstep by Thursday! Toyota Tacoma Double Cab 05-18 Single Subwoofer Box 5.0 Perfect Fit 08/15/2015 By Mike S Installed in a 2010 Tacoma with a Rockford Fosgate P3SD4-10 Punch P3S 10-Inch 4-Ohm DVC Shallow Subwoofer. The sub fit perfect, the box fit perfect and the sound is outstanding. Couldn't ask for a better made box. Toyota Tacoma Double Cab 05-18 Single Subwoofer Box 4.0 Tacoma Sub Enclosure 04/20/2015 By james dunlap My enclosure arrived as promised. Installing a Kicker 10" required a bit of work to enlarge the opening however was a snap with a small half round file. I replaced the connection block that came with the enclosure with a better quality Kicker piece. As for fit, it is perfect just what I had hoped for. Tacoma is thumping an bumping Thanks..
Toyota Tacoma Double Cab 05-18 Single Subwoofer Box 5.0 Custom 2015 Tacoma Dbl Cab Box 03/13/2015 By Joseph S. The box is awesome. It's put together quite well and fits incredibly snug behind the driver's side back passenger seat. Definitely get a grill for your subwoofer because of the way it seat hits it as it rolls back into position. You have to remove a number of panels to get it in, but you can put some back on once you get it in. The construction was perfect, I got the upgraded terminals, black color and fill. In my opinion, this is a $600 custom box for $100. If you want to use as little space for a sub in a tacoma dbl cab, this is it. I've got a 10" fosgate punch p3sd2, which is probably one of the best subs for the depth and cubic space. It pumps and the box does not rattle. I am extremely satisfied with this item. Only consideration for Super Crew, perhaps some included instructions on how to install. It's pretty straightforward but there are some panels I had to remove I wasn't expecting to. I was able to put them back on after box was seated though.